Status: Active aid to navigation owned by the U.S. Coast Guard and licensed to the American Lighthouse Foundation. The Friends of Wood Island Lighthouse – a chapter of the American Lighthouse Foundation, is dedicated to restoring the historic lighthouse. 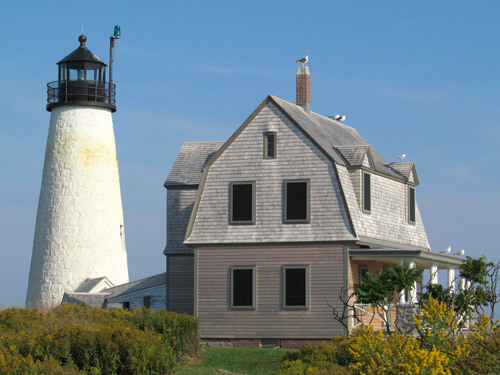 The original Wood Island Lighthouse was established in 1808 and consisted of a 45-foot octagonal wooden tower. Thirty-one years in 1839 a new conical tower was constructed out of granite to take the place of the deteriorating wood beacon. The present 47-foot lighthouse was constructed in 1858 and outfitted with a fourth order Fresnel lens later that year. The light station went through many changes over the years, including the tower’s lantern being removed in 1972, but public outcry about the ugliness of the “headless” tower resulted in the lantern being replaced when the light was automated in 1986. Lighthouse Tours: Join ALF’s Friends of Wood Island Lighthouse for a tour of Wood Island Lighthouse!